What does GWAR stand for? What does GWAR mean? This page is about the various possible meanings of the acronym, abbreviation, shorthand or slang term: GWAR. Gwar is a satirical heavy metal band formed in Richmond, Virginia in 1984. The band is well known for its elaborate science fiction/horror film inspired costumes, obscene lyrics and graphic stage performances, which feature humorous enactments of politically and morally taboo themes. 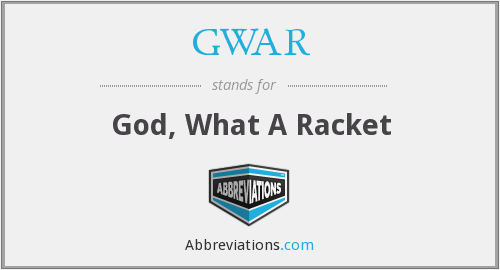 Couldn't find the full form or full meaning of GWAR? Know what is GWAR? Got another good explanation for GWAR? Don't keep it to yourself! "GWAR." Abbreviations.com. STANDS4 LLC, 2019. Web. 22 Apr. 2019. <https://www.abbreviations.com/GWAR>.